This book provides for the first time a complete look at all of Isambard Kingdom Brunel’s contributions to the great age of steamship design. From modelling boats as a child to his youthful dreams of leading a fleet of ships, he was excited by maritime ventures. His first ship was the Great Western, a wooden paddle steamer launched in 1837, and he is well known for the Great Britain and the Great Eastern. But these are not his only vessels and here they are all revealed. From humble industrial craft, his work with the Admiralty on the first screw propelled warships to vast ocean liners, Brunel was constantly sketching out his ideas. His ships travelled the world, speeding up communications and carrying large numbers of passengers across the oceans. 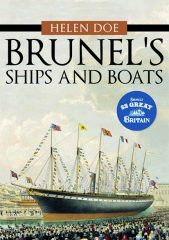 This book provides an overview of all of Brunel’s vessels, small and large, from boats to ships, leisure craft to gunboats, and follows his progression as he pushed boundaries and tested new technology. This is an excellent book and I would very highly recommend it.